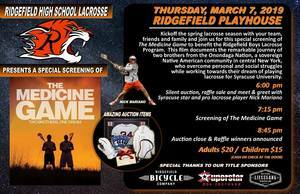 Lax players, families, friends and fans: please join us March 7th at The Ridgefield Playhouse for a special screening of the lacrosse movie The Medicine Game! This festive night includes a silent auction, raffle and meet and greet with Syracuse star and pro lacrosse player Nick Mariano! Ridgefield High School Players and coaches will be in attendance. Get inspired and get ready for lacrosse season with Ridgefield High School Boys' Lacrosse!